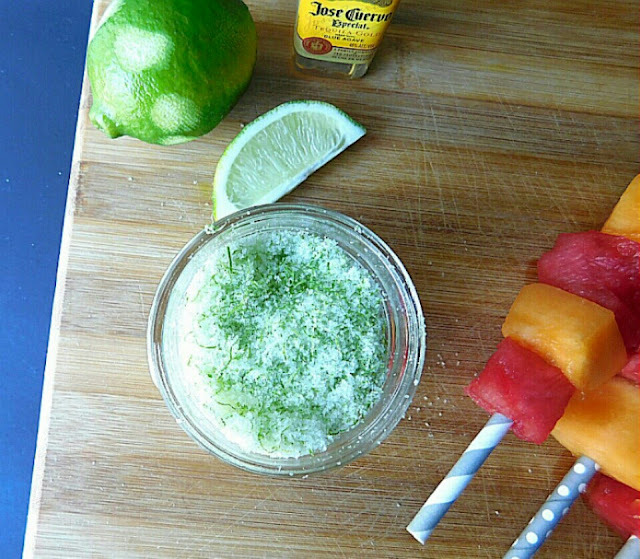 This fun fruit dessert (or special treat) borrows flavors from margaritas. 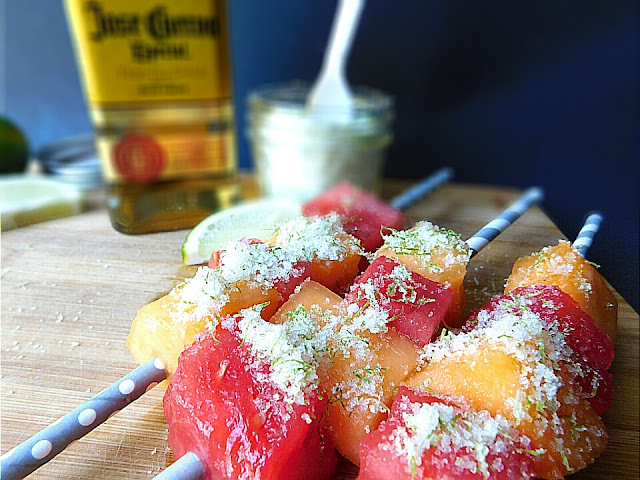 For adult fun, add Tequila to infuse the melon and cantaloupe cubes, which also get a sprinkle of sea salt accented with fresh lime zest. The longer the melon soaks, the more flavorful it becomes. If you know anything about me, you know that I hate watermelon. I mean, hate. The Devil has nothing me, because watermelon is number 2 on my Do Not Eat List. I hate the scent, I hate the texture, I hate the seeds. It's just terrible. If we were in the desert and a bite of watermelon would save me from death, y'all would just have to let me die. Ok, enough about that. You get it. Don't expect me at the Watermelon Festival. 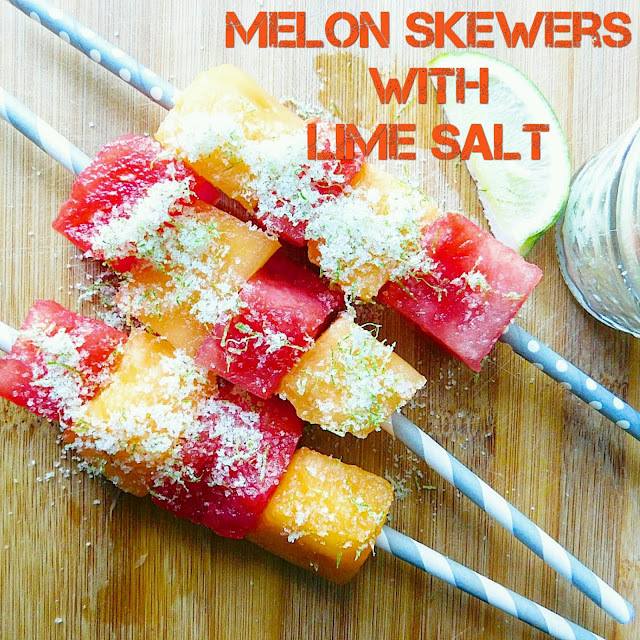 So when I first came up with the idea for the skewers, I was going to do papaya, honeydew (my fave!) and cantaloupe and call them "Adult Firecracker Melon Pops" or Bomb Pops or something like that. Then I got lazy and just decided to stick a Popsicle stick in a piece of melon, soap it in Tequila and sprinkle with flavored salt. Then I couldn't find sticks. Or my Tequila that I'd purchased. I'm not a quitter, so here is the result! I found the Tequila (I hid it from myself! ), used paper straws to thread the melon cubes and I used watermelon ONLY because it looks really pretty... doesn't it? My favorite part of this recipe is the lime salt, though! It smells so fresh and clean. I just want to put this jar in my purse and carry it around all day. As a matter of fact, I carry a vial of lime oil in my purse at all times for a quick pick-me-up when I'm fatigued or need an instant mood booster. And trust me: these skewers are instant mood boosters! TIP: For added fun, freeze the skewers (including the sprinkle of salt) so you can cool off while you enjoy them! 1. Arrange melon in a single layer in two 9-by-13-inch baking dishes. Pour Tequila over melon cubes and refrigerate for at least 45 minutes. 2. 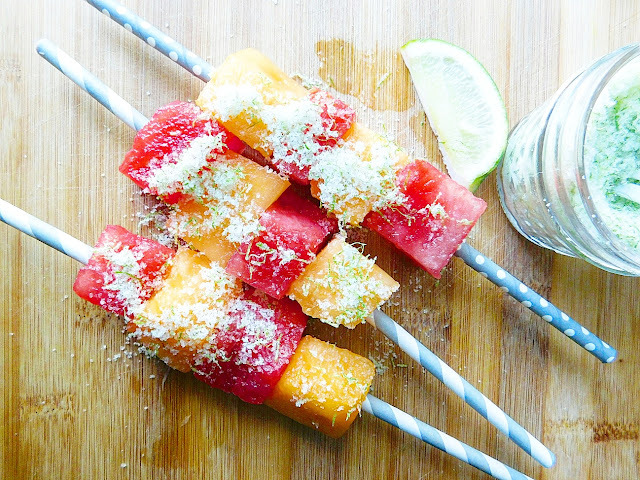 Remove melon from Tequila and thread each cube, alternating colors, onto a paper straw or wooden skewer and arrange on a platter. Season with lime salt. Serve. 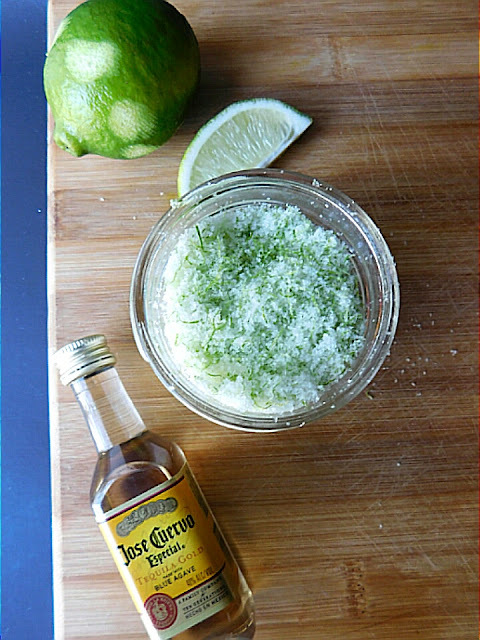 Use a spoon or a mortar and pestle to mix the zest in the salt. Store in an airtight container. Use within 2 weeks. For long-lasting salt, bake or dehydrate your infused sea salt recipes for 90 minutes at 150°F or the lowest setting your oven will allow. You don’t want your salt to brown, you just want to dry out the zest. Allow to cool completely and store in a cool dry place. Use within 1 year. Nikki, how can anyone not like watermelon? I lovelovelove it! These look so pretty and refreshing and the perfect thing to serve all summer long. My father loved salt on his watermelon and black pepper on his cantaloupe. I use a lot, and I mean a LOT, of black pepper; but I don't want it anywhere near my cantaloupe!